No, this isn't a review. I'm only "reviewing" the YA books I read. But I want to keep track of the grownup books I'm reading for my mom's book club too. While you're here mosey on over to that follow button to the left and click on it. There ya go. Liam is a pretty boy in trouble with his Dad for the last time. His father is fed up with his screwups and decides to ship him to his parents to straighten him out. Liam's fashion model mom isn't strong enough to stand up to her husband, but manages to send her son to her loving brother-in-law instead. While stuck in a small town with his largely unknown uncle, Liam learns about the true meaning of family, as well as his own family history. This was a good quick read. Liam is a likeable character even if for most of the novel he thinks that he has no personal responsibility over his screwups. He grows throughout the story. I'd recommend it to high school readers who can better understand the identity crisis Liam endures. Medford Runyuin is a typical 13 year old who feels like he doesn't fit in or belong to his society. Unfortunately for him belonging in this society is CRUCIAL. Medford lives on an Island where everything, even the people, is named after its use--and anything without a use has no name and cannot be trusted. Carpenters are called Carpenter, Farmers are called Farmer and children are able to choose which of their parents names/trades they wish to pursue. Medford has an uncertain future because of his unknown past. He washed up on the Island and was taken in by a carver and his wife. Although he works with the carver the town is not quite sure whether he can live up to the Carver name. Medford's guilt over secret feelings about unnameable objects has him unsure of himself as well. This was an entertaining read and a good commentary on art for art's sake. There's humor--one of the main characters is a "goatman"--as well as fantasy and would be good for middle school readers and older. Let me start by saying that I am out of the loop with YA lit now. I don't know what's coming out until I see it on the library shelves. 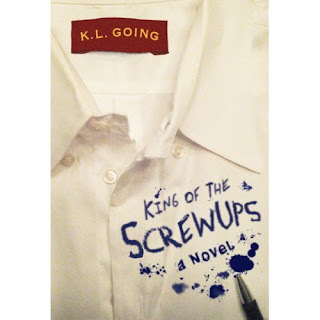 I don't know who the recent Printz winners are or what books are creating the latest buzz. I'm no longer working as a YA librarian, in fact at this moment I am not working at all since I had my third baby 3 1/2 weeks ago. So I picked this book randomly off the shelf the last time I went to the library. I didn't even realize it was the Printz winner until I saw the seal later on. 17 year old Taylor Markham attends a boarding school in Australia. She's been there ever since she was 11 years old and her drug addict mother abandoned her at a McDonalds. She is naturally a little messed up from the experience. The school is set up into houses and each house has a student leader that takes care of the younger students in the house. A teacher is assigned to each house, but does not live in it and has very little responsibility. The student leader shoulders most of the burden. Taylor is the unwilling house leader for her house, as well as the reluctant leader of an underground community. The students are all in a war with the Townies--kids who live in the town--and the Cadets--kids from a military school who come out for a few weeks each year. They fight over territory and make deals and war based on a purple book handed down to the students from 20 years ago. Taylor must deal with negotiating with the Townies and with the Cadets (the leader of which is someone Taylor has a mysterious history with) while coping with the absence of Hannah--a beloved volunteer at the school who picked Taylor up from the McDonalds and trying to understand her strange dreams about a boy in a tree. There's so much in this book it's hard to summarize anything. It's nearly impossible to put down. Taylor begins her journey as untrusting and bitter and eventually learns to open herself up to other people. She finally accepts her past, learns the truth about her family, and is able to move on and look to the future. I cannot say how much I loved this book. It's not the fantasy I usually rave about... but Marchetta pulled me in to the world she created and I could not leave until I was done with the book. It's well-written, the characters are complex and interesting, and the story is riveting. I highly recommend it! In Kristen Cashore's fantasy novel there are people called Gracelings who have extraordinary gifts. Some are graced with cooking skills or healing skills or mind reading. Katsa is a young girl graced with killing. Her uncle, King Randa, uses her abilities to maintain control over his subjects, as well as her. She does not like being the king's bully but she doesn't see a way out until she meets another strange Graceling from another kingdom. This book has everything you want. Fantasy, adventure, romance, social commentary, political intrigue, mystery. Katsa is a strong female character who stays true to her ideals. She is determined not to marry or have children. At one point I was disappointed because I thought that certain events were going to change her mind, but she didn't. She didn't change her true essence to please a man or anyone else. Cashore did a great job of creating a really strong heroine. She starts out a little lost and not understanding her grace, but by the end of the book she learns what her grace really is and what she can do with it. She finds her place in the world and accepts it. This was a great book and I look forward to reading the companion, Fire, when it comes out in the fall. This is the sequel to Airborn and Skybreaker. It is just as good as the first two. Matt Cruse is still in the Air Academy and hoping to land a job as an officer on an airship and work his way up to captain so he can seriously compete for Kate's affection and win the approval of her parents. While on break from school both he and Kate are invited to take part in a brand new adventure--in space. After a grueling 2-week training camp, Matt is ready to embark on the very first mission to space, but not without some hesitation as he has just learned that Kate is engaged. The entire book is exciting and thrilling. As expected things don't quite go as planned and what started out as a simple mission to space turns into a race for their lives. Along the way we learn Kate's true motives and intentions. This is a great blend of fantasy, adventure and romance. A must read for fans of the series. The Stravaganza series was supposed to be a trilogy. I am so glad Hoffman decided to go for more. As with the first three books there is a new protagonist, a new stravagante who travels between our world and the alternate world of Talia. Matt is dyslexic and insecure in our world, but once he travels to Talia he is able to read with no problems. He discovers the other stravaganti in his world--Georgia and Sky and Nick--as well as the ones in Talia. Readers will be happy to see Luciano and Arianna return as well. The entire series is a wonderful fantasy with a historical feel to it. It could spark an interest in the history of Italy--on which Talia is based--and the real people and places that inspired the series. A must read for any fan of the series. This is book one in the Chrysalis Queen Quartet. I will not be reading book 2. Guinevere is 13 years old and a tomboy living with her uncle and aunt since the death of her parents. There is a prophecy that she will grow to be the highest lady in the land but nobody takes it seriously, least of all Guinevere. Her aunt, the Queen, is jealous of the prophecy nonetheless and tries to advance her own daughter and hold Guinevere back. I love Arthurian legend and usually enjoy anything even remotely related to it, but I just couldn't get into this book. It took me a long time to read it and even longer to be able to post about it. Young tween girls would probably enjoy it, but the true Arthurian fan won't find anything new or special here.